Enter the Chatham's, a warm, chaotic family who run a pizza parlor, play bluegrass on weekends, and pitch in to care for their mother, who has multiple sclerosis. Here Sydney experiences unquestioning acceptance. And here she meets Mac, gentle, watchful, and protective, who makes Sydney feel seen, really seen, for the first time. I still consider myself a newbie to the Sarah Dessen fan club. I have only read 4 of her previous books before Saint Anything but it only took one book to become an immediate fan of hers! You know that feeling when you listen to a song and it brings you back to a certain moment in your life? That's the effect Dessen's books have on me. Each novel of hers brings me back to a memory of my youth, my teenage years; It may be heartbreak, the qualms of growing up, a carefree summer afternoon...Dessen's novels pluck me from ordinary life and place me into the worlds of her memorable characters. Sydney is the little sister of Peyton, a good looking, outgoing teenage boy with a loving personality that gets him through life. But all it takes for one decision to go from bad to worse and that is exactly what happens to Peyton. Now, more than ever, Sydney is stuck in his shadow; Becoming even more invisible to her family while they are left picking up the pieces after Peyton. I consider myself a big believer in fate, and if it not were for Peyton's horrible decision, Sydney never would have found herself at the courthouse or even transferred schools, which then wouldn't have led her to meet wild, care-free Layla...Who I absolutely adored(not as much as Mac but we'll get to him later!) Layla has a heart of gold, not once did I ever question her intentions. She wears her heart on her sleeve. What you see is what you get when it comes to Layla Chatham...Well, I guess when it comes to the entire Chatham family. I have now officially adopted the Chatham family as my book family. When faced with a situation I will ask myself: WWMCD(What would Mrs. Chatham do?) That women was so kind and so wise. And although faced with a devastating disease, she not once let that deter her quality of life. The amazing character traits that Mac, Layla and Rosie held was a clear reflection of the amazing Mrs. Chatham. I adored the whole family! Ok, now we'll chat Mac. One word: Swoon! Yes he is good looking, yes he plays the drums but he is also a care-giver for his mother, kind, gentle and sweet. I mean COME ON! How can you not love him?! Mac's character goes far beyond Sydney's love interest. He is a very present character and plays a big part in Sydney's growth. Saint Anything has so much heart and soul. 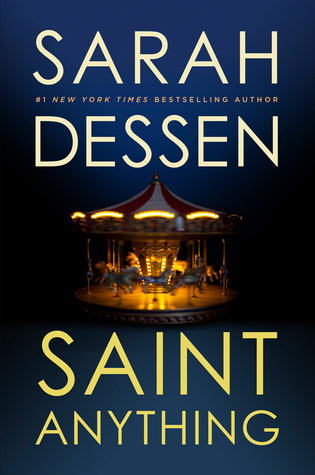 Another gem for Sarah Dessen!